Development bringing West Marine, Trader Joe’s and boat docks to waterfront will move ahead. SANTA BARBARA — Traffic is part of big city life and a project developer is not limiting public access to the water. These were the reasons given by the California Coastal Commission as to why they unanimously rejected Jon Nahhas’ appeal of the Pacific Marine Venture project at Parcel 44 in Marina del Rey on the grounds it did not raise substantial questions of concern. Nahhas appealed the project, which proposes to build a West Marine, Trader Joe’s and a boat repair shop, on the grounds it would compound already difficult traffic issues in the area and restrict public uses of the harbor. A Coastal Commission staff report elaborated upon Nahhas’ appeal. Los Angeles County, which oversees Marina del Rey, acknowledged traffic issues and took steps to mitigate impacts to make Parcel 44’s redevelopment a reality, according to commission staff. Other government agencies in the region were given an opportunity to raise traffic concerns associated with this project during the Draft Environmental Impact Report (EIR) period. None of them protested the project based on traffic impacts, according to commission staff. Transportation, and nearby cities such as Los Angeles and Culver City during the public comment period and no substantial issue was raised regarding traffic and circulation,” the Coastal Commission staff report stated. Members of the Los Angeles County Department of Beaches and Harbor (DBH) staff also countered Nahhas’ appeal, saying the proposed project actually increases public access to the water. DBH staff member Michael Tripp said while traffic in Marina del Rey is a constant problem the proposed Parcel 44 redevelopment would open up new ways to access the waterfront. Specifically plans for a public promenade, bicycle paths and water taxi would give the public greater access to the waterfront. Aaron Clark, an attorney who represents the project’s developer, said boating interests, yacht clubs and other community groups have all expressed support of the presented plans. “I’ve never seen … this much support for a project … from a broad range of people,” Clark said, adding the proposed project sets a good precedent for coastal access. Updating the bicycle thruway in Marina del Rey means cyclists will have a continuous path to ride from Malibu to Redondo Beach. The bicycle path is currently fractured in the Marina del Rey area. Commissioner Mark Vargas said the new bicycle path allows for greater access to the coast and gives people an alternative path to navigate through the Marina del Rey region. “I used the … bike path quite frequently. This is one of the segments of the bike path where you have to travel inland. If you don’t know what you are doing you can get lost,” Vargas said, adding the updated path would keep cyclists on the waterfront through Marina del Rey as they navigate north and south along the coast. This is not the first time Nahhas has appealed the Parcel 44 redevelopment project. The boating activist filed separate appeals against the project approval with the county’s Regional Planning Commission and Board of Supervisors last year. Parcel 44 can be accessed by road via Bali and Mindanao ways and is zoned for visitor-serving, marine commercial, water, and boat storage land uses. All the structures on the parcel would be demolished and replaced with eight new buildings, according to plans. 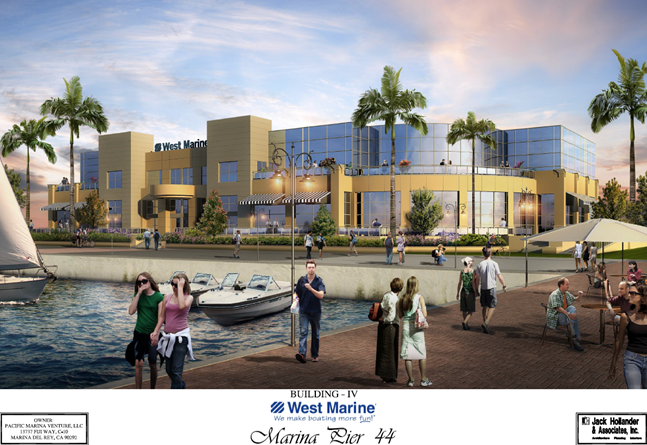 In addition to prospective tenants as Trader Joe’s and West Marine the redeveloped Parcel 44 would features boater-serving bathrooms, retail space, marina related administrative and boater’s broker offices, laundry, a yacht club, and restaurant. Also proposed, according to the Coastal Commission, is an open-air boat stacking system for up to 44 boats, a 462-stall parking lot, 100 bicycle parking stalls, a waterfront pedestrian promenade, and the realignment of a regional bicycle path. The project does not propose residential uses. This all stinks. Thanks LA County for ruining our neighborhood. It’s like a section of Manhattan being built. Look at Via Marina. Wow.